Please join us for a fly fishing school. On Sunday, March 29th, a Backwater Angler Guide will be teaching a fly fishing school that is ideal for beginners. If you’re planning on flyfishing Maryland, or anywhere else for that matter, this course is a great introduction to the sport. The school covers knots, casting, gear and fly selection. Class is held from 11:00 AM till 2:00 PM. Cost is $125 per person and includes the use of gear. A Maryland non-tidal fishing license and trout stamp is required and may be purchased at the shop with check or cash the day of the school. Class size is limited to 4 and pre-registration is required. Please give us a call at 410-357-9557 to pre-register. This entry was posted in events on March 23, 2015 by Theaux Le Gardeur. This entry was posted in gear on March 22, 2015 by Theaux Le Gardeur. Need a little color to brighten up the winter blues? 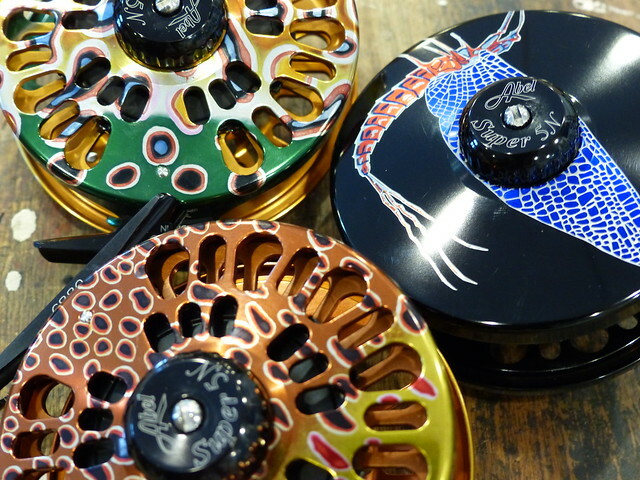 Stop in and check out the California handiwork exhibited by the Abel reels at Backwater Angler including a trio of Super 5N reels (top photo, clockwise) DeYoung Montana Brown, Mayfly, Brown Trout and (bottom photo, clockwise) 11-12N in Dorado, 9-10N in Atlantic Salmon, 7-8N in Chrome Steelhead and a 7-8N in Bonefish. 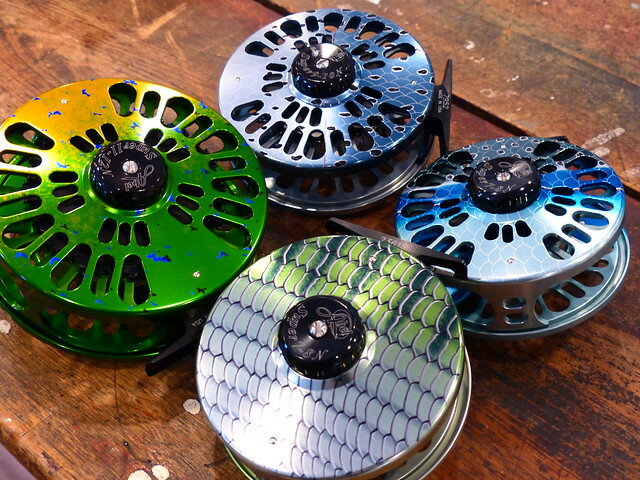 These beautiful reels are testament that you don’t need a lot of fly reels-just the “right” ones. This entry was posted in gear on March 20, 2015 by Theaux Le Gardeur. The River crested at the Falls Rd gauge at 5.82 ft and 1,200 Cfs on Wednesday, March 11. 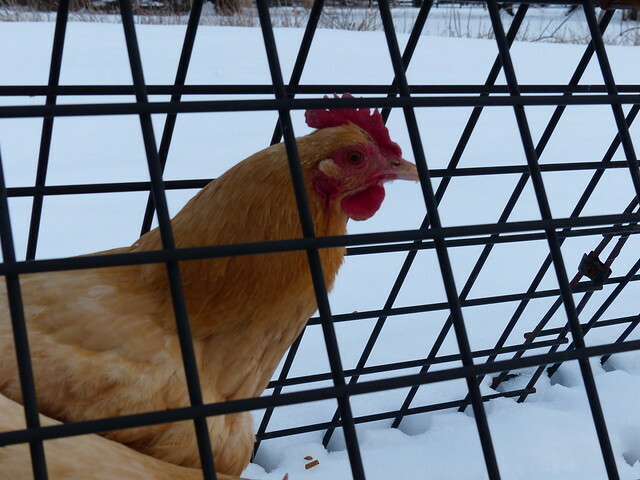 The Spring thaw was not gentle in the least. 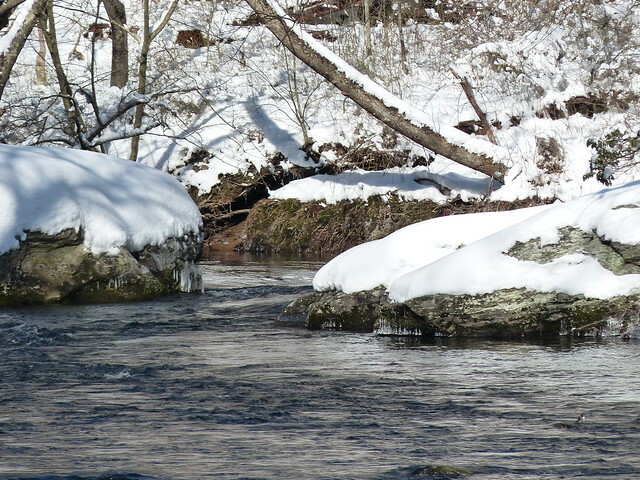 Today, Friday, the 13th flows are down in the mid 300’s making fly fishing the Gunpowder River challenging at best. With more rain in the forecast and Prettyboy reservoir at over 100% of capacity it’s likely that the River will experience another bump upwards over the weekend. If the River stays above 350 Cfs fishing streamers from the safety of the banks may be the best and only option. To give one perspective, the shop does not guide when the River is over 285 Cfs so this weekend might be better spent hiking along the trails and surveying the impacts of flooding to the river corridor than fishing it. This shot from the lower river at Upper Glencoe Rd (which is closed for stocking till the morning of the 28th) shows the remnants of the 2, 000 Cfs plus flows downriver recorded at the Glencoe gauge. 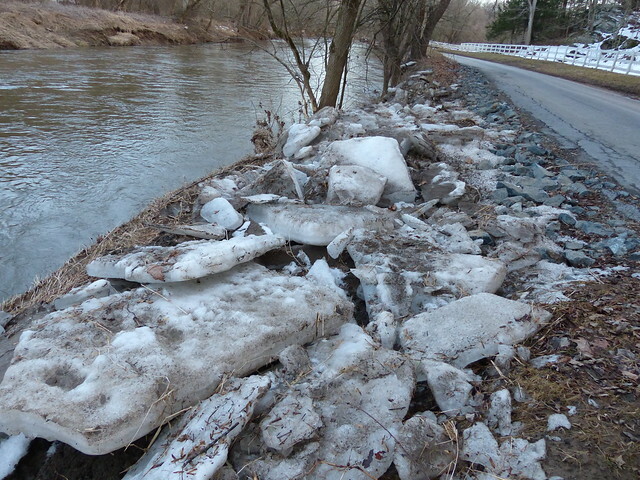 Hopefully this is the last of the river ice we’ll see for a while. We’ll be in the shop this weekend if should you need a break from the house, garage, office, in-laws ect.. We are still, among other feats, writing 2015 Maryland fishing licenses-just be sure to bring your old license or drivers license and check or cash for the license payment and we’ll get it squared away for you. This entry was posted in fishing report on March 13, 2015 by Theaux Le Gardeur. This entry was posted in fishing report on March 7, 2015 by Theaux Le Gardeur. 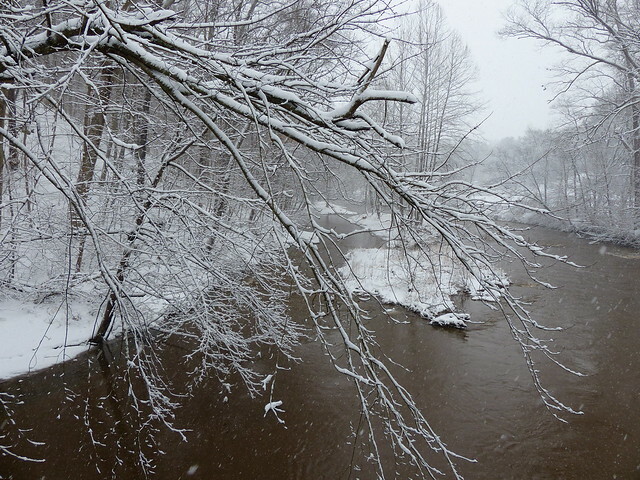 This snowy branch frames a yearling and two geese on the island downstream of the Corbett Rd. Bridge. 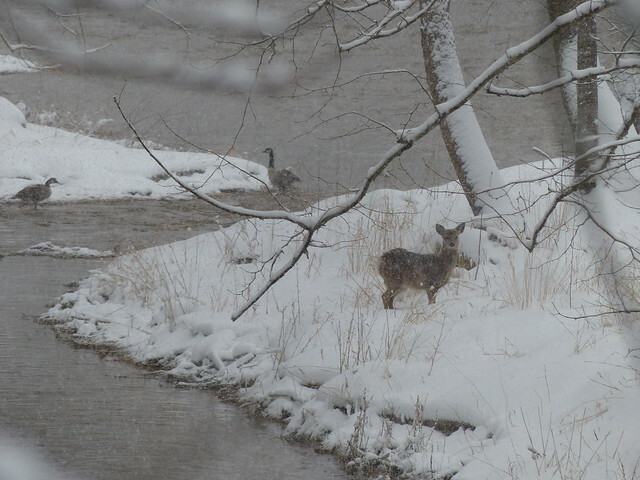 The yearling crossed the side channel and found itself on this island with a pair of geese waiting out the storm. 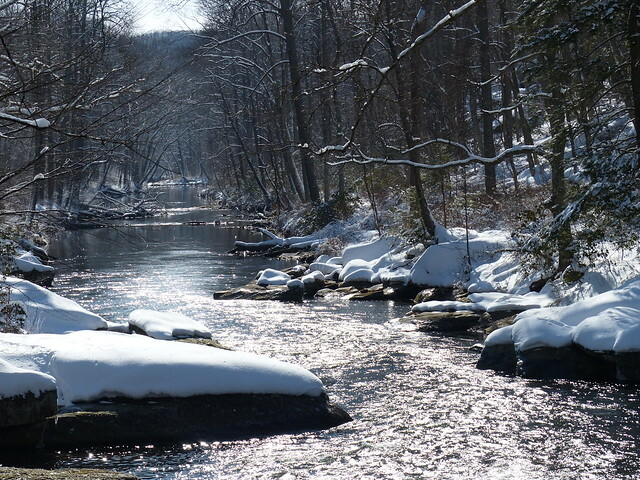 The Gunpowder River crested at 2,200 Cfs and 7.75 feet at Glencoe Rd. during the heavy rain event that cleared much of the old snow out and down into Loch Raven. This entry was posted in fishing report on March 5, 2015 by Theaux Le Gardeur.